Chef Walter Staib of A Taste of History shares this vanilla ice cream recipe. According to Chef Staib the founding fathers were critical in bringing the dessert to America, even First Lady Dolley Madison was a fan. One respected history of ice cream states that, as the wife of U.S. President James Madison she served ice cream at her husband’s Inaugural Ball in 1813. 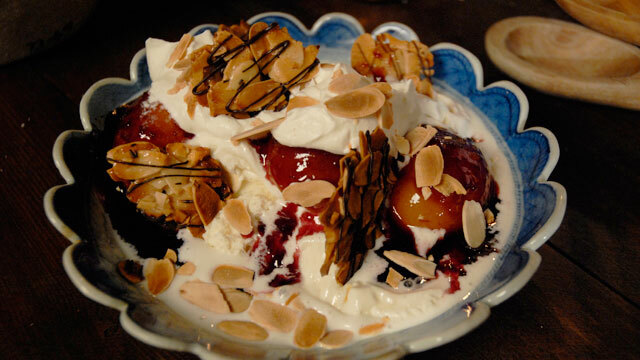 This vanilla ice cream is pictured with sauce and almonds, which you may add or change to include your own toppings. Prepare an ice bath by filling a large bowl with ice water and setting a slightly smaller bowl atop. Slowly add hot cream to egg mixture, ¼ cup at a time, whisking all the while. Return the pot to the stove and cook over low heat, stirring constantly with a rubber spatula, until it is thick enough to coat the back of a spoon. Transfer the custard to the ice bath and cool it, stirring occasionally, until it is cool to the touch. Remove from ice bath, cover, and refrigerate until cold. Spin in ice cream maker following the manufacturer’s instructions. Mix the sugar and cornstarch in the top of a double boiler. Stir in the milk, syrup and eggs. Cook over boiling water, stirring all the time for 10 minutes or until the mixture has thickened. Chill. Stir in cream, extract and coloring. Freeze in a 2 quart ice cream freezer according to the manufacturer’s instructions. When partially frozen, add crushed peppermint and continue frequently. The following recipe is credited to First Lady Dolley Madison. Dolley Payne Todd Madison (May 20, 1768 – July 12, 1849) was the wife of James Madison, President of the United States from 1809 to 1817. 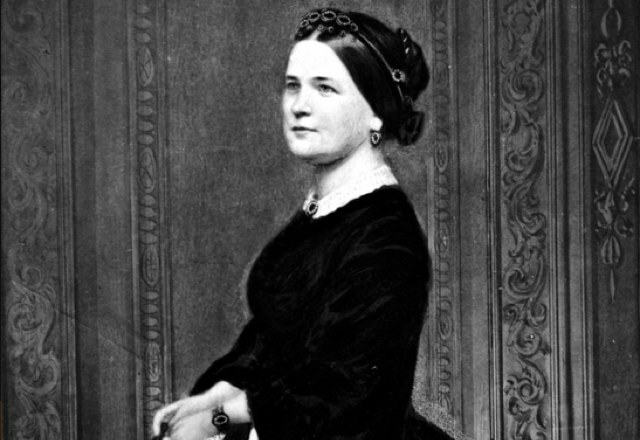 According to Wikipedia, she was noted for her social gifts, which boosted her husband’s popularity as President. In this way, she did much to define the role of the President’s spouse, known only much later by the title First Lady – a function she had sometimes performed earlier for the widowed Thomas Jefferson. 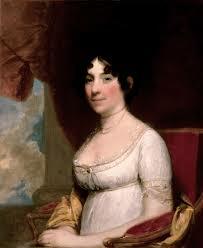 Dolley Madison also helped to furnish the newly constructed White House. When the British set fire to it in 1814, she was credited with saving the classic portrait of George Washington. Directions: In a bowl, cream cheese and butter together. Add remaining ingredients and mix thoroughly to form dough. Roll out dough on a floured board to 1/4″ thickness. Using a sharp knife, cut into strips about 1/2″ x 4″ wide. Place strips on an un-greased baking sheet. Bake 400°F for 8 minutes until golden brown. This delicious white cake, with a subtle almond flavor, was one of Mary Todd Lincoln’s specialties. Some historians say the First Lady didn’t serve the cake with frosting, but it certainly adds great flavor. Abe was honestly crazy over Mary’s white cake. Cream butter and sugar until light and fluffy. Sift together flour and baking powder; remove 2 tablespoons and set aside. Add sifted ingredients, alternating with milk, to creamed mixture. Stir in vanilla and almond extract. Combine almonds with reserved flour and add to batter. Beat egg whites until stiff. Add in salt. Fold into batter. Pour into three greased and floured 8- or 9-inch cake pans. Bake for about 20-25 minutes or until a toothpick inserted in the center of the cake comes out clean. Cool 5-10 minutes then remove from pans and cool on racks. While cake is baking, prepare frosting: Combine sugar and water in a saucepan, stirring until sugar is dissolved. Bring to a boil; cover and cook about 3 minutes until the steam has washed down any sugar crystals that may have formed on side of pan. Uncover and cook until syrup reaches 238-240 degrees on a candy thermometer. Whip egg whites until frothy; add in syrup in thin stream, whipping egg whites constantly until frosting is spreading consistency. Mix in cherries, pineapple and vanilla or almond flavoring. Frost cake once it has cooled. 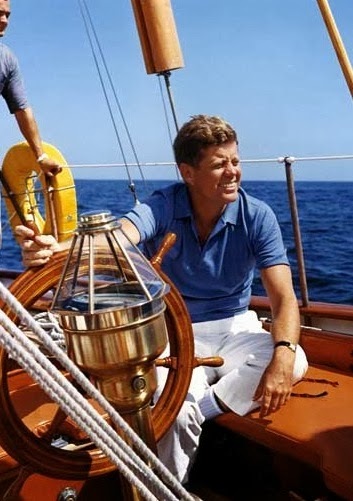 John F. Kennedy, the 35th United States President, was reportedly not a big eater and had to be reminded about meal times. But when he did dine, he was true to his New England roots. Heat oil in a large saucepan over medium heat. Add bacon and cook until crispy, 4 to 6 minutes. Transfer half of the cooked bacon to a paper towel-lined plate with a slotted spoon. Add onion, celery, and thyme to the pan; cook, stirring, until beginning to soften, about 2 minutes. Add potato, clam juice, and bay leaf. Bring to a simmer, cover, and cook until the vegetables are just tender, 8 to 10 minutes. Whisk milk, cream, flour, and salt in a medium bowl. Add to the pan and return to a simmer, stirring, over medium-high heat. Cook, stirring, until thickened, about 2 minutes. Add clams and cook, stirring occasionally, until the clams are just cooked through, about 3 minutes more. Makeover tip: Check sodium carefully when using clam juice because the amount of sodium can vary dramatically between brands. We use Bar Harbor clam juice with only 120 mg sodium per 2-ounce serving. Shopping tip: Look for fresh clam strips at the seafood counter. White House Executive Chef Henry Haller’s White House Family Cookbook offers dozens of First Family recipes; a historic treasury of American cooking. Chef Haller entertains with tidbits of presidential lore and his memories of life upstairs and down. 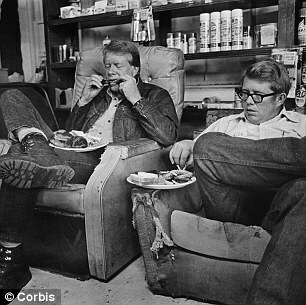 Former President Jimmy Carter (L) with his brother Billy eating barbecue on the campaign trail in 1976. Another favorite of the president is cornbread. 1. Preheat oven to 425 degrees F. Butter inside of an 8-inch square baking pan. 2. In a large mixing bowl, combine flour, yellow and white cornmeal, baking powder, salt and sugar. 3. In a smaller mixing bowl, beat egg with warm milk, using a wire whisk. Stir in melted butter. 5. Scrape batter into the prepared pan. Bake on lower shelf of preheated oven for 20 minutes, or until top is golden and toothpick inserted near center comes out clean. 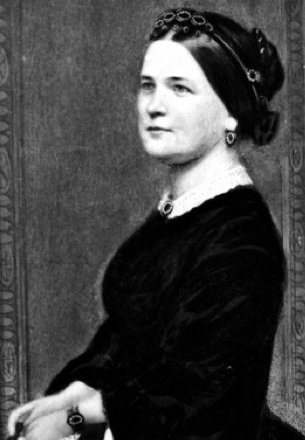 Mary Ann Todd Lincoln was the wife of the sixteenth President of the United States, Abraham Lincoln, and was First Lady of the United States from 1861 to 1865. A member of a large, wealthy Kentucky family, Mary was well educated. She was born December 13, 1818 in Lexington, KY and died July 16, 1882 in Springfield, IL. This delicious white cake, with a subtle almond flavor, was one of Mary Todd Lincoln’s specialties. 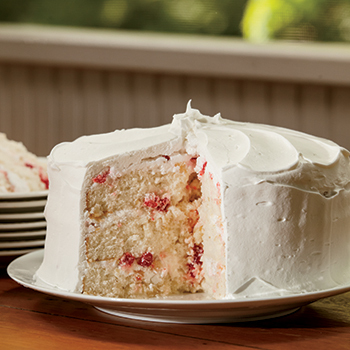 Some historians say Mary Todd Lincoln didn’t serve the cake with frosting, but it certainly adds great flavor. 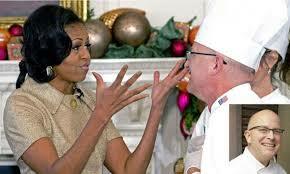 First Lady Michelle Obama and White House Pastry Chef Bill Yosses. President Barack Obama calls him the crust master and says he’s the mastermind behind the best pies he’s ever tasted. 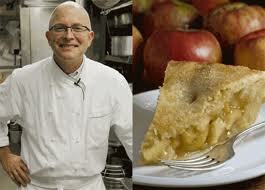 Read more about White House Pastry Chef Bill Yossess’ and learn the secrets behind his apple pie. White House Pastry Chef Bill Yosses and the apple pie loved by the president.